The intersection of Broadway and Commercial Drive, seen from the Broadway SkyTrain station. Broadway is a major east-west thoroughfare in the city of Vancouver, British Columbia, Canada. In Vancouver's numbered avenue grid system, it runs in place of a 9th Avenue, between 8th and 10th. The street has six lanes for most of its course. Portions of the street carry the British Columbia Highway 7 designation. The route begins as "West Broadway" at the intersection of Wallace Crescent and 8th Avenue, in the affluent residential neighbourhood of West Point Grey, a few kilometres east of the University of British Columbia (UBC). Past Alma Street, Broadway takes over from 10th Avenue as one of Vancouver's major thoroughfares, as it enters Greek West Broadway (or Greektown) section of Vancouver's Kitsilano district. East of here are several blocks of generally trendy, upscale shops interspersed with low-rise apartment blocks and small supermarkets. The surrounding neighbourhoods generally consist of large, older homes dating from the early twentieth century, many of which have been subdivided into rental suites. As Broadway approaches Arbutus Street, the commercial establishments become larger before transitioning into a mix of small to mid-size apartment blocks. East of Burrard Street, the apartment blocks get progressively taller, and commercial establishments larger and busier. 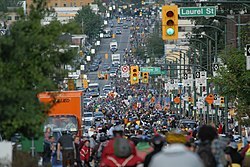 Between Burrard and Main Street, Broadway can be considerably congested by vehicular traffic. Past Granville Street, Broadway yields completely to medium-to-large commercial structures and high-rise apartments and condominiums. Between Cambie and Main, the commercial establishments become smaller and somewhat more downscale. At Ontario Street, two blocks west of Main, the route becomes "East Broadway." After bisecting Main and Kingsway, traffic on Broadway eases somewhat, and the character returns to a mix of small-to-medium apartment buildings and commercial establishments, interspersed with older homes - all considerably less affluent than those to the west. At Commercial Drive, Broadway passes by the Commercial–Broadway SkyTrain Station. Past here for several blocks, the neighbourhood consists predominantly of older residential homes. As Broadway travels east of Renfrew Street, the neighbourhood once again becomes mixed, with older homes to the north and larger industrial, commercial, and warehouse establishments to the south. Broadway finally ends at Cassiar Street, just short of the Vancouver-Burnaby boundary, where it becomes the Lougheed Highway. Broadway was created at the turn of the 20th century, along with other gridded roads south of False Creek, to meet the needs of an expanding population in Vancouver. The name of the route was changed from 9th Avenue to Broadway in 1909, at the behest of merchants around Main Street (at that time the hub of Vancouver commerce), who felt that it bestowed a more cosmopolitan air. Commercial establishments originally spread out around the intersections of Cambie and Main Streets, while the character of the rest of the route remained predominantly single-family dwellings. By the 1970s, the length of Broadway had become a major arterial route in Vancouver, conveying commuters from downtown to the neighbourhoods of the west and east sides. With the growth of UBC and the expansion of the Vancouver General Hospital (one block south of Broadway between approximately Oak and Cambie), traffic demands accelerated. In the 1990s, the agency then responsible for public transit in Greater Vancouver — BC Transit — introduced an express bus route, the 99 B-Line, to help reduce congestion. The Vancouver transportation plan for Broadway notes that congestion is such that the bus service is at capacity, and will not be eased until a new rapid transit line is built paralleling the street. It is anticipated that the SkyTrain's Millennium Line will be extended to Central Broadway by 2021; the extension is expected to connect with Canada Line at Broadway-City Hall Station, at the intersection of Broadway and Cambie Street. ^ Numbered Routes in British Columbia, British Columbia Ministry of Transportation and Infrastructure. Accessed online July 15, 2009. ^ Walker, Elizabeth (1999). Street Names of Vancouver. Vancouver Historical Society. p. 16. ISBN 0-9692378-7-1. ^ TransLink took over BC Transit's public transport operations in Greater Vancouver in 1999. This page was last edited on 6 September 2017, at 00:10 (UTC).